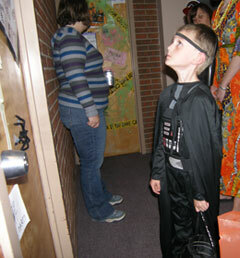 Trick-or-treater Brenden Schatz participates in last year's UW Safe Treat. This year's Safe Treat will be Friday, Oct. 30, from 4-6 p.m. in the Wyoming Union and 6-8 p.m. in the residence halls. The University of Wyoming will provide multiple ways for families to have a safe and warm trick-or-treating experience. Safe Treat will take place Friday, Oct. 30, in the Wyoming Union from 4-6 p.m., and in the Greek houses and residence halls from 6-8 p.m. Trick-or-treaters can participate in games and activities such as cookie decorating, and, of course, collect a lot of candy. "This event gives youths an opportunity to familiarize and identify themselves with a positive college environment," says Becky Adair, area coordinator for Downey Hall. "It also provides college students who are away from their families a sentimental connection to home." The Wyoming Union Safe Treat will be hosted by UW recognized student organizations, UW departments and Laramie community organizations. The residence halls Safe Treat is hosted by the Department of Residence Life and Dining Services. For more information, contact Adair at radair1@uwyo.edu or (307)766-3577.